An interesting holiday spot in South India, Courtallam is famous for its Courtallam Falls in the Western Ghats of Tamil Nadu in Tirunelveli District. Though the falls are located in Tamil Nadu, it also shares the boundary of Kollam district of Kerala State. Also known as Kuttralam Falls, it has gained an extreme popularity, since the water here is believed to have great curative properties for a number of skin problems and even nerve disorders, as they run through a forest of herbs. The town is famous for its pleasant climate and abundant natural beauty. There are nine places at Courtallam where the River Chittar cascades over 92 m., at varying volumes. The falls are at its best during the rainy season (July to late August) and one can see heavy flow in all the places during this time. There is a parking fee of 10/- Rs at every waterfall. The nine waterfalls at Courtallam are - Main Falls (Peraruvi), Small Falls (Chittaruvi), Chembakadevi (Shenbaga) Falls, Honey Falls (Thenaruvi), Five Falls (Aintharuvi), Tiger Falls (Puliaruvi), Old Courtallam Falls (Pazhaya Courtallam), New Falls (Puthu Aruvi), Fruit Garden Falls or Orchard Falls (Pazhathotta Arvui). Besides the water falls, the town is famous for its two temples, Thirukuttralanathar dedicated to Lord Shiva and the another one dedicated to Lord Muruga. It is refreshing to take a bath in the waters of the falls and there are facilities for oil massages near the falls as well as in and around the town. Courtallam is essentially a place for rest and relaxation. But during season, the place could get crowded and less cleanly. As its name suggests, the Main Falls or Peraruvi is the most popular and the biggest among the nine falls. Falling from a height of 60 m, it is located right inside Courtallam town. Here one can find water not only during the season but also in off season (November to January). During the peak season, this area becomes too crowded and one might have to queue up for a bath. Near this fall, is the Thirukootachalanathar Temple, dedicated to Sri Thirukutralanathar (Shiva) or Thirukootachalapathi and Kuzhalvaimozhi Amman (Goddess). The temple has inscriptions about Chola and Pandya Kings. Chitra Sabhai nearby exhibits paintings from the Puranas and is believed to be one among the five Sabhas where Lord Nataraja is said to have presented his cosmic dance. Situated just above the Main Falls, is Chittaruvi or the Small Falls. There are steps which provides easy access to the Falls. Also, there are facilities for men and women to bathe separately here. A ticket is required to enter the area. Situated on the way to Honey Falls and about an hours ( 3km) uphill trek from the Main falls is the Chembakadevi Falls. It got its name because of its location near the small temple of Shenbagadevi. During full moon days numerous pilgrims visit this temple. Vendors sell the fragrant Shenbaga flowers on the way to the temple, which is an offering here. It is situated 4kms from the Main falls and is named after the beehives that form on the face of the rock during dry season. The picturesque horseshoe shaped waterfall which falls vertically from three sides to join into a small lake, is worth seeing. But though the place is gifted with panoramic views of rainforests and huge rock formations, the waterfall is not easily accessible and is a risky trek. The trek will takes almost 2 hours and people are not allowed to bathe in the falls as it is very dangerous. Situated 2 kms from Courtallam bus stand, it is a small waterfall with a Sastha Temple and a bathing ghat for pilgrims, nearby. It is a perfect and safe place for children to enjoy. Nearby is a old palace, now a private property. 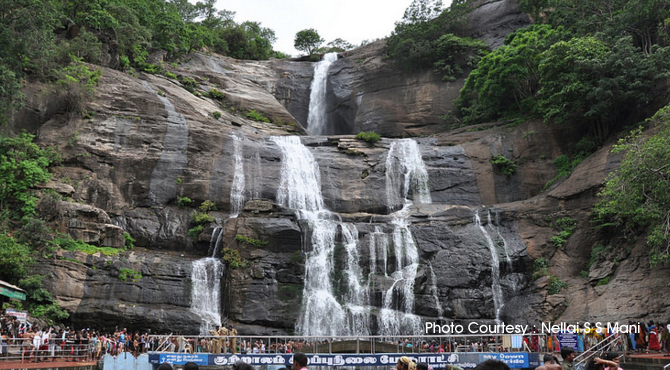 Situated 4 kms away from Courtallam, Five falls is the most beautiful waterfall at Courtallam. As the name suggests, these falls separate into five sections before cascading down close to the Aravankadu Pass. Among the five falls, three are open to men and two for women. People have compared the cascade spread in five sections with that of the five heads of a hooded cobra. The hitch is that the place echoes with loud speakers blasting songs and advertisements continuously. There is a Swami Ayyappa Temple and Vinayaka Temple near the waterfall. There is a fruit stall nearby selling fruits like lichees, eggfruit, mangosteen, abundant in the area. Situated 10 km from the center of the town, along the road to Tenkasi, is the Old Falls (200 ft). Here steps are cut out into the rocks to break the water's free fall. It is comparatively less crowded here, especially late at night. There are facilities for oil massages, and men and women have areas to bathe separately. The other important falls at Courtallam are Fruit Garden or Orchard Falls (Pazhathotta Aruvi); and New Falls (Puthu Aruvi), situated amidst forests gives beautiful views of Courtallam town and is very attractive. Then there is the Agasthiyar falls, more than half an hour away, the first waterfall on the way to Courtallam by road, and the scenic Papanasham or Tambiraparani river dam with its serene lake and surrounding mountains, 45kms or one hour drive from Courtallam.